The Art Shop/Bruce Webber Gallery has announced it’s closing so that Bruce Webber can spend more time with his family. As the doors close, there will be an “End of an Era Sale” beginning TODAY. After 61 years in business, everything must go! The art community sends Bruce and Maryanne good wishes on the next part of their journey. These two creative souls brought art to life in Palm Beach County and specifically to Lake Worth. When you attend the famous Street Painting Festival – remember who started it! The Rickie Report shares the details here. Stephane Cruz’ paintings will be featured at the Bruce Webber Gallery in Lake Worth Fl. The public is invited to a free, Opening reception on Thursday, March 9th. An abstract expressionist, favoring strong colors and innocent form, Stephane is a member of the Armory Art Center and the Photographic Centre. The Rickie Report shares the details and some sneak peeks. Stephane Cruz was born and raised in Belgium, where he graduated in Fine Arts with Distinction. Stephane is a member of the Armory center and the Photographic centre at West Palm beach. He considers himself an abstract expressionist. He tells The Rickie Report, “I favor strong colors and likes to paint spontaneous decorative in an innocent form”. Stephane goes on to explain, ” I am an expressive painter, my paintings are influenced by decorative children’s drawings. Birds, cats…and distorted human figures play a main role in my work. I paint intuitive of everyday things. I mainly use bright colors: white, red, blue, yellow and black whilst using violent brush strokes”. “Being strongly influenced by the “ Cobra Artist’ , I suppose being a Belgian and having studied at the Academy of Fine Arts. I use mostly Sennelier acrylic and oil paints as I like the body and the saturated pigments. I also use encaustic medium. To quote Karel Appel “ Through play we renew contact with childhood – my art is childlike”. CoBrA was a European avant grade movement active from 1948 until 1951. The name was formed by Karel Appel, Constant, Corneille, Christian Dotriment, Asger Jorn and Joseph Noiret from the initials of the members’ home cities : Copenhagen ( Co) , Brussels (Br) , Amsterdam (A ) . Stephane resides in Wellington Florida, where he has a painting and clay studio and spends most of his time creating new projects. Lake Worth is world famous for its outstanding and largest Street Painting Festival, where art transforms the asphalt into an outdoor gallery. Now Lake Worth is GOING A-WALL! From July 25th through the 27th, the public is invited to watch as three internationally known award winning artists create a trio of large scale murals in downtown Lake Worth. Local artists are invited to participate. The Rickie Report shares the details and knows you won’t want to miss the excitement that Bruce Webber Gallery and Hydra Projects brings! This 3 day live art event will also include Live Music, Cellograff Wall, Food Trucks, An Outdoor Bistro Area and Entertainment by Path/Plan Beats. Dave’s Last Resort will also host an area on North K Street. Bruce Webber Galleries and Hydra Projects are joined by other sponsors, including Street Painting Festival, City of Lake Worth and Kobra Paint. Be part of this contemporary movement in the art world and cities and towns all over the world! This is an opportunity to watch performance art in a new way. It was first introduced to Lake Worth during its 20th Annual Street Painting Festival in February. Local artists will create on the scene during this live painting event. The three original murals will set the stage in downtown Lake Worth by transforming the blank walls of retail buildings into art in public spaces…one wall at a time. This is just the beginning of a metamorphoses! Art in Public Spaces is an expression of the community as well as a landmark and an attraction. This unique art event is a special opportunity to view these artists at work and witness first-hand the evolution of art in our city from traditional community art projects to more complex expressions of socially engaged art works and creative thinking. Over 67,000 ballots were used at Clay Glass Metal Stone Cooperative Gallery to vote for the enormous 2014 PEEPS® display! The Rickie Report will share a few of the most popular ones in this article. In addition, there a MANY events, classes, sales and workshops that you’ll need to mark in your calendars. Get ready for May in Downtown Lake Worth and take a Springtime ramble through this Little Village by the Sea! You can see them all of the entries at CGMSPeeps.blogspot.com as well as in our Facebook albums (Clay Glass Metal Stone Gallery on Facebook.) Clever, funny, and we bet you can’t wait for next year already! With your help, Lake Worth is rapidly becoming the epicenter of South Florida’s Great Arts Renaissance. This month, you are invited to directly contribute to this. On May 6, The Community Foundation and United Way are hosting the Great Give. This is one day of giving, on line, to hundreds of non-profits throughout Palm Beach and Martin Counties. On May 6th, Lake Worth, Flamingo Clay Studio, Clay Glass Metal Stone Gallery is participating in the Great Give. Enter all gifts must be made by credit or debit card on www.GreatGivePBC.org or www.GreatGiveMartin.org or by calling 1-844-GIVE-DAY (1-844-448-3329). Minimum Donation is $10.00. Go to www.greatgivepbc.org/#npo/flamingo-clay-studio and contribute $10-$10,000. Every donation FCS receives will be multiplied with bonus dollars from the Community Foundation and a National Pool. The funds raised by Flamingo Clay Studio will be used to train students from Lake Worth High School’s Arts Department in the building and installation of ceramic, mosaic walls in Lake Worth’s most blighted neighborhoods. The funds will also be used for scholarships for economically challenged senior citizen artists, to build a huge, community accessible kiln complex and to continue construction on the regions largest 3-D artists studios for glass blowing, large metals foundry, clay, ceramic, fused glass and small metals studios. This project, once fully funded and complete, is expected to become an international arts destination. If you miss the May 6th Great Give, you can still contribute to this non-profit artists’ project. On website CGMS.FlamingoClayStudio.org, you may make a tax-deductible contribution through PayPal. ModSquad (The Merchants of Downtown Lake Worth) have many fine art gallery members for you to visit during the month of May. All exhibits are constantly changing. Make the month of May your Art Tour Month through the Historic Village of Lake Worth. Start your tour on the 600 block of Lucerne and visit the Lake Worth Arts League, South Florida’s oldest arts association. Their beautiful gallery is filled with paintings and photography. Head west to the MaryAnne and Bruce Webber Galleries, located on the 700 block of Lucerne the longest established galleries and framing establishments in Lake Worth. 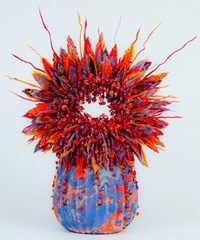 Make a left hand turn on J street and walk two blocks to 15 South J Street, The Clay Glass Metal Stone Gallery, Palm Beach County’s first non-profit 3-D artist cooperative. Head back to the 800 block of Lake Avenue for the Robert Pardo (Artefacts) Gallery featuring the works of Laura Anne Jacobs. Travel east to ShoeStrings Gallery located in Palm Beach Interiors. There are many other little galleries located in the nooks and crannies of the town. 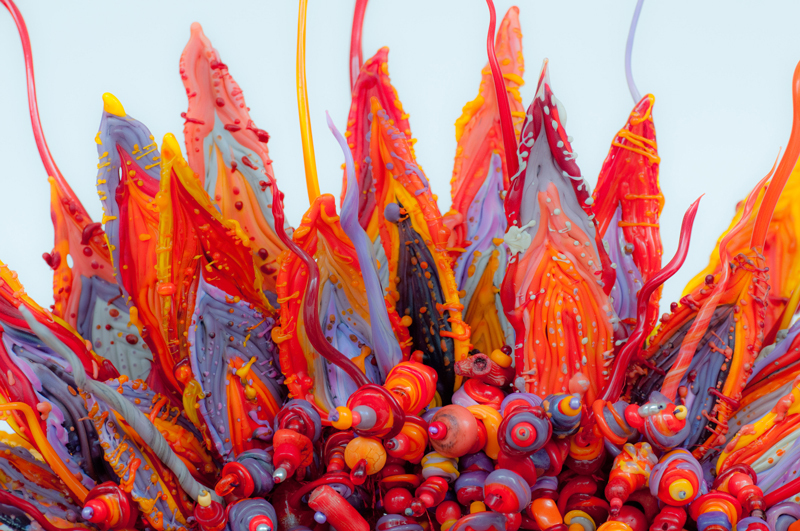 Take a day to explore and delight in the art that fills this town. Don’t miss the gallery inside the Cultural Council of Palm Beach County (601 Lake Avenue) and see two SOLO exhibitions, Ray P. Neubert and Leora Klaymer Stewart (look at previous Rickie Reports for more details). Then walk across the street and visit Artisans on the Ave. (630 Lake Avenue). Fine Art and fine craftsmanship are found in many shops throughout the town. At Lake Worth Jewelers, 615 Lake Avenue, master designer and jeweler, Richard Fahnoe, is creating one of a kind jewelry with gold and diamonds. After one piece is cast, the mold is destroyed. Lake Worth Jewelers has been in downtown Lake Worth for thirty-two years. Their hours are 9-5, Monday-Saturday. Brogue’s Down Under, 621 Lake Avenue, has learned the formula for packing in crowds for dinner and a show. With their elegant and newly windowed back restaurant, diners can come in for a fine meal and to enjoy their Thursday evening (5-8PM) Rod Stewart Tribute Band. Watch for additional evenings with addition tribute groups to spring up on a regular basis. Lake Worth now welcomes exciting new Street Performers to town beginning in May. FlowSource has found a new home in Lake Worth. Every First and Third Friday in May for Lake Worth’s Evenings on the Avenues, FlowSource will be presenting a flowing team of powerful, creative, and joyful individuals dedicating their lives to what they love to do best. These artists are excited to share many forms of performance arts. They will mesmerize, captivate, and amaze you. You will laugh and join in the fun. Come see: Live painting and portraits by Zipporah SkyWalker, Spoken Word/Poetry acapella and musical accompaniment by Casandra Tenenbaum, Brian Ritter, and Emily Andari. Poi, Staff, and Hula Hoop performances by Patrick Kiebzak, Jeremiah Collins, Blair Welcome, and Cassandra Tenenbaum. Watch as these performers, especially as they use LED and fire props! They inspire community connection through playful interactions and create a showcase spectacle in Downtown Lake Worth that links the community with performers, artists, and merchants. The Lake Worth Playhouse and the Stonzek Movie Theater are the finest antiques Lake Worth has to offer. The buildings are architectural gems, well worth the visit. Sitting inside the theater brings you back 100 years. Within the beautiful surroundings of this glorious theater, you can experience wonderful and affordable productions. The Stonzek Movie Theater shows independent and rare films seen nowhere else in the county. The alliterive Second Saturday Sidewalk Sale (May 10th) in Lake Worth is always filled with Big Bargains and a ThirdEye Adventure. The Second Saturday Sidewalk sales fill the downtown streets with treasures. Long cherished, Bees Knees, has lost its lease in Lake Worth and is looking for a new site. You Bees Knees addicts can find their extrodinary and affordable treasures every Second Saturday on the parking lot of CGMS Gallery, 15 South J Street. This is Lake Worth’s example of neighbor helping neighbor. The best way to get the Bees Knees up an running again is to come downtown and make sure you buy out their parking lot sale. GotThirdEyeAdventures.com raises money for local charities. This month’s adventure is “Back to Boston,” a bar crawl and tap takeover. This adventure will feature an 80’s Costume Contest with food, fun, music & prizes. Stop by McMow Art Glass located at 701 North Dixie Hwy. to see their workshop, supply area for all things “glass” and their studios. Classes and workshops are available year round! Friday, May 16, Clay Glass Metal Stone Gallery (15 South J Street) celebrates its 5th Anniversary in downtown Lake Worth. The party starts at 6PM. Some of Palm Beach’s best performers come out to celebrate this anniversary. In keeping with Gallery Anniversary Tradition, Butterflies will be handed out to the first 100 visitors. Champaign and cake will be served. Metal Clay Classes for Charity: Ruth Ekiert of Trinkets and Treasures teaches regular classes in metal clay and resins to raise funds for a local non-profit. Metal Clays can be worked with to make jewelry and art objects. Once fired in a kiln, the clay burns out and you are left with silver, copper or brass. (Most classes in the area cost $140 plus materials for a four hour class). Ruth charges $75 including materials. Groups are welcome. Classes are set up at your convenience. Six person minimum. The Merchants of Downtown is a group that meets weekly to make Downtown Lake Worth a welcoming destination for neighbors and visitors alike. The MOD Squad, as they fondly refer to themselves, organizes block by block bringing activity, unity and camaraderie to the Downtown corridor. For additional information contact JClay6@aol.com . Having just completed its premiere launch into the art world with Art Palm Beach, Art Synergy is not resting on its laurels. 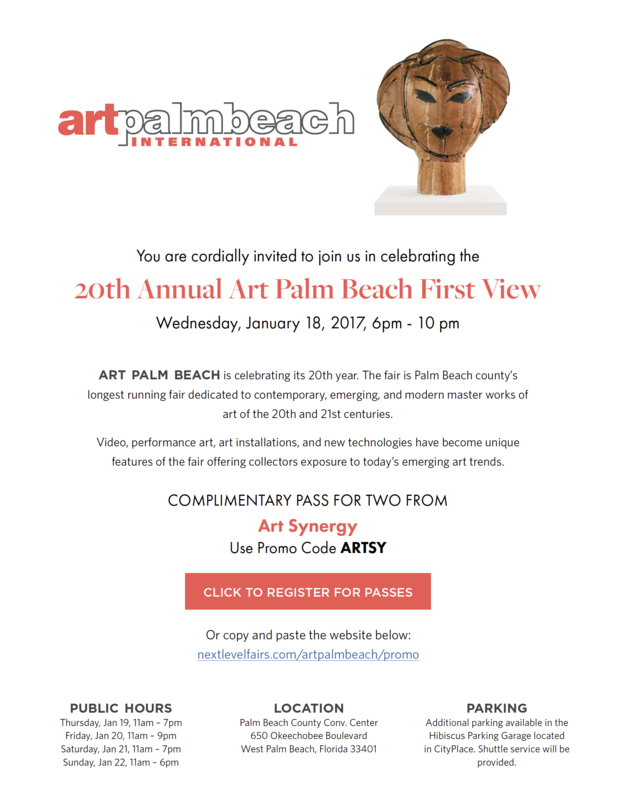 This week, Art Synergy will partner with the American International Fine Art Fair which convenes at the Palm Beach County Convention Center Feb. 4th through Feb.9th. There will be three Art Loops: Art X (Northwood Village), Continuum (W. Palm Beach) and Art Fusion (Lake Worth). The Rickie Report shares the details with you in this article. Long regarded as the most elegant annual fair of the American winter season, AIFAF offers an unmatched cultural experience for discerning and sophisticated collectors. A selection of prestigious international galleries and an informative, educational lecture program attract substantial attendance each year. Henri Le Sidaner’s “Intérieur, lumière de la fenêtre” oil on canvas, Versailles, 1931 from Richard Green (London); Alfred Sisley’s “Bougival” oil on canvas,1876, Claude Monet’s “Le Chemin de Halage Ã Granval” oil on canvas, 1883, and Pablo Picasso’s “Paysage de Juan-les-Pins” oil on canvas, 1925, from Gladwell & Patterson (London); Pierre-Auguste Renoir’s “Vue de Montmartre, Paris” oil on canvas, 1885, from Willow Gallery (London); the 11th largest emerald in the world, a 187.69 CT natural emerald set with 18K yellow gold and 5.82 CT diamonds on a hand-crafted lariat chain from Yvel (Jerusalem); a French cased pair of Rifled Percussion Pistols of presentation quality decorated with elaborate gold-encrusted vine patterns by Louis-Francois Devisme ŕ Paris, dated 1852 from Peter Finer (London); Pieter Claesz’ “Still life with crabs” oil on canvas, 1657, from Caretto & Cartategui Fine Arts (Madrid) and Henri Labasque’s “Scene de Plage,” oil on canvas, from Guarisco Gallery (Washington DC). Additionally, a contemporary and personal selection of works from Nelson Mandela, HRH The Prince of Wales (benefiting his charitable foundation) and foremost landscape painter Susan Swartz will also be available courtesy of Belgravia Gallery (London). Additional participating galleries include AANW, Inc. (Miami Beach), Art House 423 (West Palm Beach), Artopia (Miami), A.B. Levy (Palm Beach), Archeus/Post-Modern (London), Atlanta Fine Rugs (Atlanta), Browse and Darby (London), Contemporary Art Projects USA (Miami), Contessa Gallery (Cleveland), David Brooker Fine Art (Southport, CT + Surrey), Eostone (Dania Beach), FERMA (Barcelona), Galerie Jacques Bailly (Paris), Gallery FW (Chicago), Gary Rubinstein Antiques (Miami), Haynes Fine Art of Broadway (Broadway, UK), Holden Luntz Gallery (Palm Beach), Imperial Fine Books (New York), JGM Art Limited (London), John Jaffa Antiques (London), Lucy B Campbell (London), Mark Borghi Fine Art (New York), Martin DuLouvre (Paris), Masriera (Barcelona), Maxoly (Miami), Michael Goedhuis (London), Percy’s Silver and Stephen Kalms (London), Potterton Books, (North Yorkshire, UK), Robert Lloyd Fine Art & Antiques (New York), Sylvia Powell Decorative Arts (London), The Silver Fund (Palm Beach), Venice Projects (Venice) and Whitley Collection (Dania Beach). While travelling in Australian in the early 1990s, Guerinni-Maraldi and her husband purchased a major work by Freddie Timms,“Sugar Bag,” (acrylic on canvas, 180 x 230 cm) painted during the artist’s time working with Frank Watters (Watters Gallery) in Sydney. This magical painting was the single catalyst that spurred Guerinni-Maraldi to begin exhibiting and selling contemporary art in London in the new millennium. Each year, she travels to Australia visiting remote indigenous communities, curators, collectors and artists. Her efforts in the United Kingdom aim to establish a greater awareness of high quality indigenous work and to build a stronger market for ethically sourced, contemporary Australian indigenous fine art. For the last 20 years, Michael Goedhuis has been at the forefront of the popularization of contemporary Chinese art. Goedhuis will examine that tradition, its relevance today, and how new works can be combined with ancient material. Goedhuis has held many exhibitions on the new Chinese brush painters, most recently at the Saatchi Gallery in London in 2013. Holden Luntz of Holden Luntz Gallery Palm Beach presents a look inside Naundorf’s series on haute couture fashion including her work for Chanel, Dior, Jean Paul Gaultier, Lacroix, Elie Saab, Lagerfeld and Valentino. Her artistic process through this series was very thorough as she researched the history of the houses, explored the archives of the couturiers, and chose the models, hair and makeup. With her research, she created lively storyboards, as well as written summaries of her productions, which include personal interviews with designers. Géza von Habsburg is an internationally renowned author and leading authority on Fabergé. Much of his career has been devoted to organizing and curating exhibitions all over the world. He served as the curator and organizer for Fabergé, Jeweller to the Tsars (1986–87) at the Kunsthalle in Munich. Also, while a Board Member of the Fabergé Arts Foundation, he was Chief Curator of Fabergé, Imperial Court Jeweler (1993–94), which was shown in Saint Petersburg, Paris and London. He also served as Guest Curator of Fabergé in America, which toured five cities in the United States (1996–97). As an educator, Géza von Habsburg served as an associate professor at the New York School of Interior Design, the Bard Graduate Center for Studies in the Decorative Arts, and New York University. He is currently a lecturer for the Metropolitan Museum of Art in New York. Last year saw a transformation of AIFAF with the adoption of an easily navigable floor plan, a more contemporary presentation and a fashionable new restaurant and VIP facilities. Together, these elements offer an extraordinary atmosphere for viewing and purchasing the museum-quality art. Each work is vetted by experts who carefully examine for quality, authenticity and condition, ensuring that collectors may buy with confidence. This year’s AIFAF will be followed by the inaugural Miami Art + Design (MA+D) from February 13 – 18. Set in a spectacular waterfront location “in the round” at Bayfront Park in Miami, it is now possible for visitors from afar to visit chic Palm Beach and alluring Miami on successive weekends. MA+D will showcase more than 40 prominent international art and design galleries featuring fine and decorative arts from Old Masters, Impressionism and Post-Impressionism to Post War and Pop Art offering collectors an opportunity to view and purchase treasures rarely seen outside major museum collections. MA+D is produced by International Fine Art Expositions (IFAE) in collaboration with the SNA, the organizer of the prestigious Paris Biennale and co-organizer of New York’s Salon: Art + Design. AIFAF is open to the public February 5 – 9 from noon – 7 p.m. (on February 7 until 9 p.m.) at the Palm Beach County Convention Center located at 650 Okeechobee Boulevard in West Palm Beach. One-day passes are $20 per person in advance; $25 at the door and multi-day passes are $25 in advance and $30 at the door. Passes are available for advance purchase at http://ifae.ticketleap.com/aifaf2014/. International Fine Art Expositions (IFAE) founders David and Lee Ann Lester have pioneered more international fine art fairs than any global fair organizer since 1991, having established Art Miami in January 1991, The Palm Beach International Art & Antique Fair (now AIFAF) in 1997, Art Palm Beach in 1998 and MIA in 2010. They have organized more than 90 international art fairs, worldwide, in New York, Los Angeles, Beverly Hills, Chicago, Dallas, London and Hong Kong. For more information, please call 239-949-5411 or visit www.ifae.com, facebook.com/IFAE01 and twitter.com/_IFAE. Two, Free Guided Art Walk of Galleries 6pm and 7:30 pm include: Artist demonstrations, lectures, and art exhibitions. Hennevelt’s Gallery 510 Northwood Rd. Northwood Glass Art & Gifts 524 Northwood Rd. OSGS, Ortiz-Smykla Gallery-Studio 500 Northwood Rd. Bohemia AG 536 Northwood Rd. Suzanne Connors Fine Art Gallery 538 Northwood Rd. Harold’s Coffee Lounge 509 Northwood Rd. Christopher Gatelock Imagine Studios & Art Gallery 512 Northwood Rd. RAW Gallery 508A Northwood Rd. Gallery 418 418 Northwood Rd. “Rooted Ground Unlimited” by Anthony Burks,Sr. Clematis Street is the historical heart of Downtown West Palm Beach. The Clematis flower ironically is known as the “traveler’s joy”. The vision for the Continuum location 312 Clematis is just that, the traveler’s joy in experiencing art in the Art & Entertainment location of central West Palm Beach. West Palm Beach Downtown Development Authority (DDA) is the Title Sponsor for CONTINUUM and A.T.B. Fine Artists & Designers LLC is the design & curating team for CONTINUUM. LULA Lake Worth Arts District: Featuring a colorful, artistic, and vibrant cultural landscape along the main streets located west of Dixie Highway, Lake and Lucerne, visitors can find the energetic Urban Arts Lofts of Lake Worth. The eclectic mix of galleries, music venues and unique specialty studios means there is never a shortage of things to do. Downtown Lake Worth, long known for its charming eccentricities in art deco architecture, culture and people has opened its arms to a rebirth of some of the finest visual arts, experimental music forms, dance and theater groups. This is reflected in the many locally-owned boutiques, art galleries, vintage shops, and specialty and jewelry stores. Flamingo Clay Studio, Lake Worth Art League Gallery, Art Link International, Clay Glass Metal Stone Cooperative Gallery, Bruce Webber Galleries, Maryanne Webber Galleries, Margot Stein Gallery, Artefact Pardo Gallery, McMow Art Glass, Art Gallery Designs, Shoe String Designs, Local Smoking Domain, and Artisans on the Ave are just a few of the participating galleries.